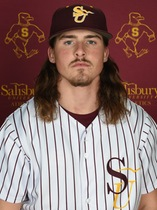 Salisbury continued to increase its run total, adding two more in the seventh inning with a Jimmy Adkins (Delmar) sacrifice fly into center field, and a Will Gutekunst RBI single through the right side of the infield. Adkins (4-0), who was also the starting pitcher for the Sea Gulls, followed up a complete-game shutout from a week ago with another stellar performance on the mound. Jimmy Adkins (Delmar) was perfect through the first 7 1/3 innings before surrendering a no-doubt solo home run with one out in the eighth. He would still get the complete game victory, scattering four hits across all nine innings, allowing only one earned run, and striking out eight batters.